Original Antique Maps and Prints. Description: From: "A Collection of Voyages and Travels" published by John and Awnsham Churchill in London in 1744. Artists and Engravers: Made by'Johannes Kip' after'A. Johannes Kip (b Amsterdam, 1653; d London, 1722). Dutch draughtsman, engraver and dealer, active in England. He was a pupil of Bastiaen Stopendaal (16361707) from 1668 to 1670. His earliest dated engravings are of 1672 e. The Siege of Groningen , Hollstein, no. 4, and he supplied numerous plates for books published from that date onwards. His work brought him into contact with the court of William of Orange and in 1686 he produced six plates depicting William of Orange, his Wife and Attendants near The Hague Hollstein, no. Shortly after the Glorious Revolution of 1688 Kip followed the court to England. After settling in Westminster, he worked extensively for London publishers, engraving works after Francis Barlow, Caius Gabriel Cibber e. Interior of the Danish Church in London , 1697; Hollstein, no. 6 and other London-based artists. His engravings were principally destined for book illustrations. The work for which Kip is best remembered is his large corpus of topographical engravings of country mansions, which were published first in 1708 as Britannia Illustrata: Or Views of Several of the Queens Palaces, as Also of the Principal Seats of the Nobility and Gentry of Great Britain, Curiously Engraven on 80 Copper Plates. This book is among the most important English topographical publications of the 18th century. The subjects were engraved by Kip after birds-eye drawings executed by Leonard Knyff. The 65 folio plates of The Ancient and Present State of Gloucestershire (1712) by Sir Robert Atkyns (16471711), drawn and engraved by Kip, are among the finest collections of topographical illustrations in English publishing. They are also reliable illustrations of the development of the English garden. Kip also dealt in prints from his house in St Johns Street in Westminster. 1728, bookseller, was connected with the family of the Churchills of Colliton, Dorsetshire, and I was the son of William Churchill of Dorchester. He was apprenticed to Cieorge Sawbridge, and he and his brother John entered into business as booksellers and stationers at the sign of the Black Swan in Paternoster Row. They'were of an universal trade,' says Dunton. I traded very considerably with them for several years ; and must do them the justice to say that I was never concerned with any persons more exact in their accompts and more just in their payments' Life, i. They published in 1695 the edition of Camden's'Britannia' by Bishop Gibson, who used a manuscript (now lost) of John Aubrey, which he called'Monumenta Britannica,' lent to him by Churchill, and which was preserved by the Churchill family down to the commencement of the present century. A second edition of Gibson's Camden was issued by Awnsham alone in 1722. Their next most important publication was the well-known work with which their name is usually associated :'A Collection of Voyages and Travels, some now first printed from original MSS. Others translated out of foreign languages and now first published in English ; in four volumes, witn an original preface giving an account of the progress of navigation,' &c. It was issued to subscribers in that year, and the publishers stated that they possessed materials for two more volumes. These came out in 1732,'printed by assignment from Messrs. The first four volumes were reissued (new title-pages only) in 1732 ; a' third edition' of the six volumes is dated 1744-6; and another by Thomas Osborne, 1752. A Collection from the Library of the Earl of Oxford,' London, T. Osborne, 1745 and 1747, 2 vols, folio, known as the'Harleian Collection,' and a similar collection by John Harris (1744-8, 2 vols, folio), are usually added to Churchill's collection, making up a valuable set of reprints of voyages and travels. It is stated on the title-page of the third edition that the preliminary essay on the history of navigation is'supposed to be written bv the celebrated Mr. Locke,' and it is includea in the works of the philosopher (1812). The authorship is doubtful, but Locke had much to do with getting together the materials of the collection, which is likely to have been produced at his instigation. Locke was upon friendly terms with Awnsham Churchill for many years, and left him a small legacy. Subject: Antique print, titled:'The Fort Fredricksburg formerly to ye Danes and now Fort Royal. 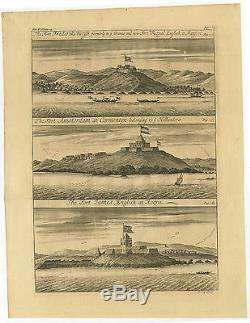 A three panel copperplate engraving showing three forts on the West African Gold Coast, Ghana; a The Fort Fredricksburgh formerly to ye Danes and now Fort Royal. English at Manfroe, b The Fort Amsterdam at Cormentyn belonging to ye Hollanders, c The Fort James, English at Accra. Condition: Size (in cm): The overall size is ca. 31.6 x 41 cm. The image size is ca. 24.3 x 34.8 cm. Size (in inch): The overall size is ca. 12.4 x 16.1 inch. 9.6 x 13.7 inch. Medium: Engraving / etching on hand laid (verge) paper. ThePrintsCollector Peter Cornelissen, Margo van Latum - van Dongen, Frank van Latum Zeeland - The Netherlands. We guarantee our items to be genuine original. GO TO OUR STORE and explore our huge collection of fine antique maps and prints. FIND SIMILAR ITEMS IN OUR STORE. Visit our Store: we would like to invite you to review similar items in our Store or to browse through all other items in our Store. We are confident that you will find very special unique antique maps and prints in our Store. It is our privilege to have you as a customer. The item "Antique Print-GOLD COAST-GHANA-FORT AMSTERDAM-AFRICA-Churchill-Kip-1744" is in sale since Monday, July 10, 2017.